Am I always late to the party? Maybe homeschool moms have been talking about boundaries for a long time I just haven't been paying attention. Last week I had an epiphany about BOUNDARIES. I had an epiphany about why I need them and also it became pretty clear to me how to set them. Homeschooling moms seem (for the most part) to be a very sacrificial, generous type. We aren't used to a lot of free time, therefore we don't place a high value on having much of it. We homeschool our children because we feel called to do so, so it stands to reason we might feel passionately called to other things, as well. Take me, for example. I feel 100% called to homeschool my children, but there are other things that compete for my time - and are important to me. These are just five other things I value, but I could list more. After the health crises with our dads in the past month (I'm happy to report they are both doing much better - still rehabbing, but hopefully being released in the next couple weeks) and also my husband leaving his old job and accepting a new one, I've found my time and mental energy stretched to the limit. At first I did a horrible job of setting boundaries. But then something hit me, and it as if a huge WEIGHT was lifted from my shoulders. I simply released myself from feeling obligated to everyone. I stopped answering so many texts and emails. I decided I need to put my homeschool and immediate family FIRST. I needed to give up CONTROL (this is SO hard) of things that don't truly fit into my mission of motherhood. Essentially, I realized that the world will keep spinning if I give up some things, and that MY FAMILY'S WORLD will be happier because of it. I had to give up an opportunity to serve in a capacity for my church that was of great interest to me. I need to stop being the "youngest child" and let other members of my family pick up slack when needed - which I will say, they are HAPPY to do. I simply have to say NO to most things that come my way. Our children and spouses should be our first priority. Just because we homeschool our kids doesn't mean they get the best of us. Do not let people take advantage of you "being at home" - because our job as homeschooling moms is as demanding (if not more demanding) than any full time job I have ever worked. We are training hearts, souls, and minds. It is IMPORTANT work that deserves to be done well and with limited distractions. Even that last paragraph was hard to type... I think my old habits will die hard, but I am committed to keeping life simple, and my husband is holding me accountable! So I'm curious: have you learned how to set boundaries as a homeschooling mom? Last Tuesday there was no Classical Conversations community day. We've had an extra week to complete work and get caught up in general from a very hectic few weeks. Last week a friend and I had a nice talk about being the "fun mom". I told her I missed being the mom that did fun things with my kids, so I was intentional this week about putting the books aside and enjoying learning. 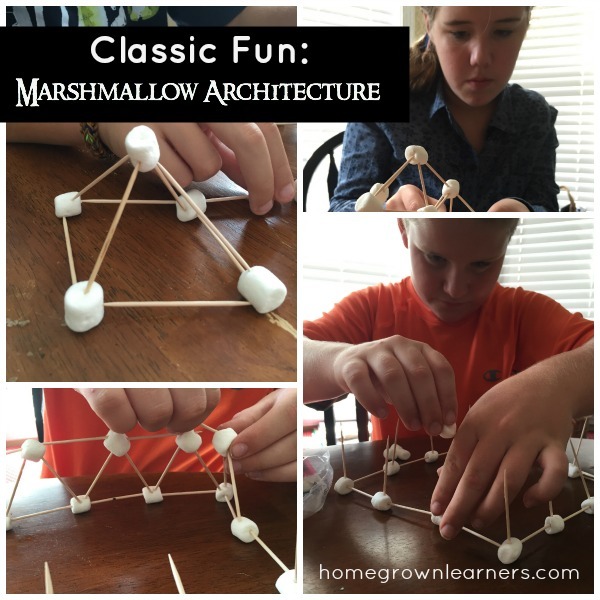 Grant had a friend over for the day and we made marshmallow structures. We did talk about triangles being more stable than squares and firm foundations. We also just had fun around our kitchen table and I am happy to report that MY STRUCTURE was the highest! Anna's Challenge B history of science assignment this week was a paper about Samuel Morse. 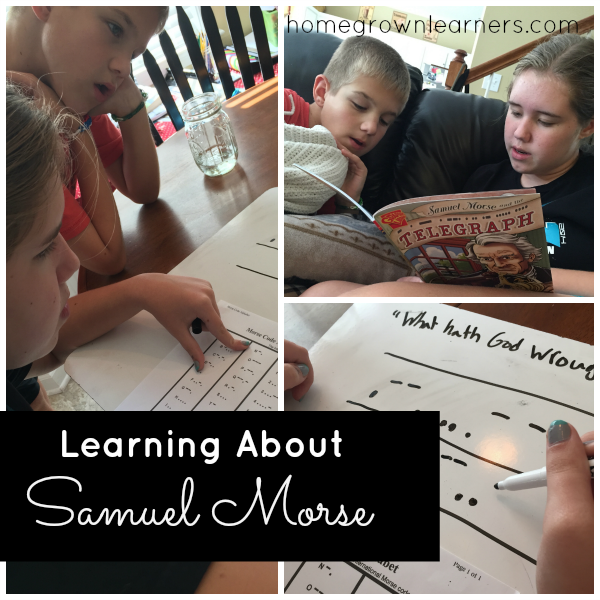 I wanted to make it more fun than just book and internet research, so the kids read Samuel Morse and the Telegraph (a fun graphic library book). They also played around with Morse Code, using our white board to write out their names and different phrases. We found a Morse Code translator and they followed along - fun! One of Anna's assignments is to be able to tap "What God Hath Wrought" for class next week, so they practiced that, too. I shared last week that my husband is leaving his job of 18 years to jump into the consulting world. This is a big and exciting step for him and for our family. I am immensely proud of him. 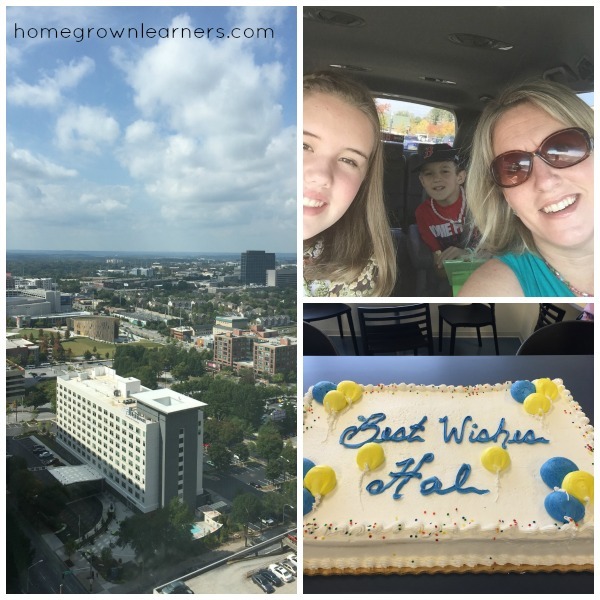 We surprised him at his going away party at work in downtown Atlanta. As people around the room were asked to tell stories about Hal, each one remarked about his patience and responsibility. Not one person had ever seen him flustered or angry in 18 years. That's my husband. Monday he begins his new job as a senior IT consultant for a completely different firm. He will be working from home and traveling, so there will be adjustments all around. 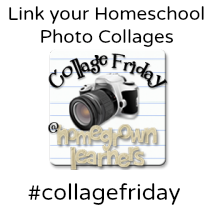 I'll be interested to see what next week's Collage Friday post will be like - with a new job for dad life is sure to be lots different!